Ever felt a little bit out-of-phase with time? As if somehow you stepped into a different era? 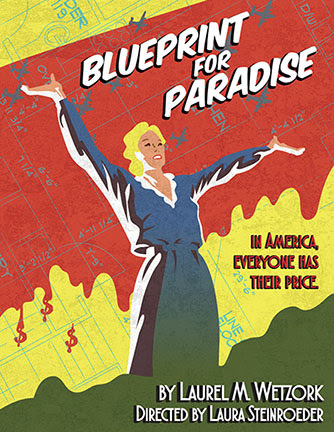 Well, given that Blueprint For Paradise by Laurel M. Wetzork takes place in 1940, this should be something you feel while watching it, yes? Yes! And...no. Because while the play recreates the period with considerable finesse, it also uses a style that while generally popular I don't see much anymore. But I'll get to that in a moment. Los Angeles remains a city of many an urban legend, one of the juiciest surrounding a fifty-acre plot of land in the Pacific Palisades. Different versions exist, but central to nearly all remains the notion of a covert Nazi camp/training ground (possibly post-apocalyptic haven) with at least some foreign funding. Certainly something big had been planned, with work from several architects, including (this makes for a very intriguing twist) the most prominent African American architect of the day! What is the truth? No one knows. 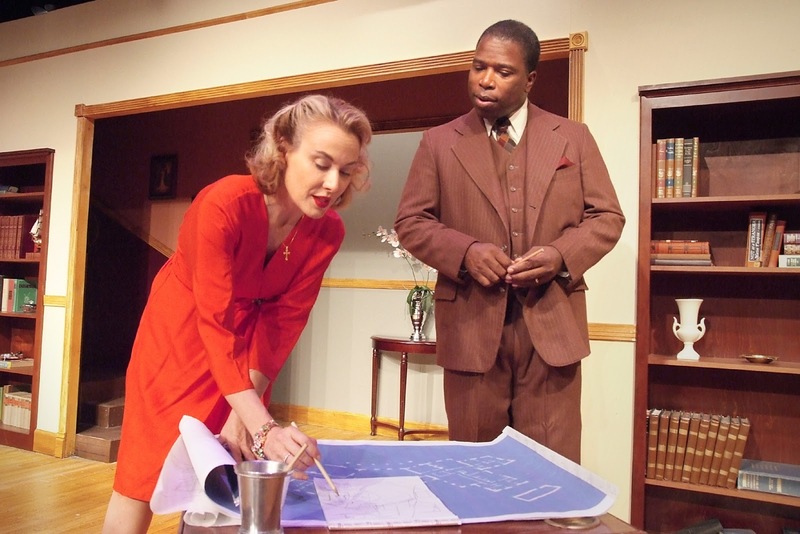 The central relationship of the play is between the aforementioned architect, Paul Revere Williams (Regi Davis) and Mrs. Clara Taylor (Meredith Thomas) wife of the businessman who is the public face of what the former believes to be a refugee camp. Clara had no idea the man who designed so many homes and building she liked was (to use the period term) colored. Her husband Herbert (David Jahn) hits the roof, but the German backer Wolfgang (Peter McGlynn) quite likes the idea. Along the way, we meet a circle of characters surrounding the rather bizarre situation. 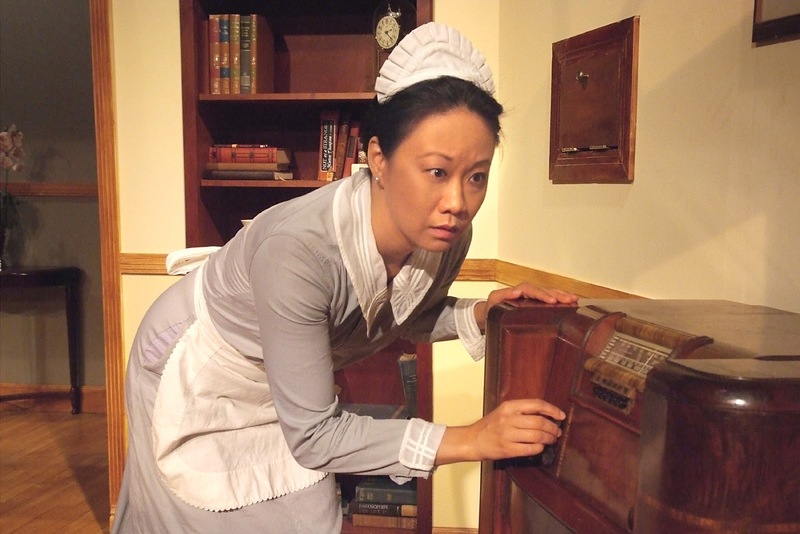 There are the Taylors' servants--Fenny (Ann Hu), their Chinese maid and Alex (Alex Best) their Italian-American chauffeur. Then of course there's Ludwig (Steve Marvel) an ardent Southern Nazi wannabe eager to turn back the clock, preferable to the Confederacy. All uniformly do fine jobs with their roles, although clearly Davis and Thomas have the plumb parts, getting to do the most with them. Despite what counts as very high production values in many of the areas that matter most--acting especially--a couple of flaws stand out as well, both in the script. But then, are they flaws? Depends. Blueprint For Paradise frankly comes across as quite old fashioned in overall style. Taking place entirely within a living room in a nice neighborhood of 1940s Los Angeles, it exemplifies what at school we used to call the "well made play." Most popular in the 1930s, 40s, 50s and 60s this style creates a vitamin pill of elements designed to hit all the right notes and give a satisfying conclusion. Such satisfaction isn't a matter of a happy ending, but one that moves the audience with great precision. 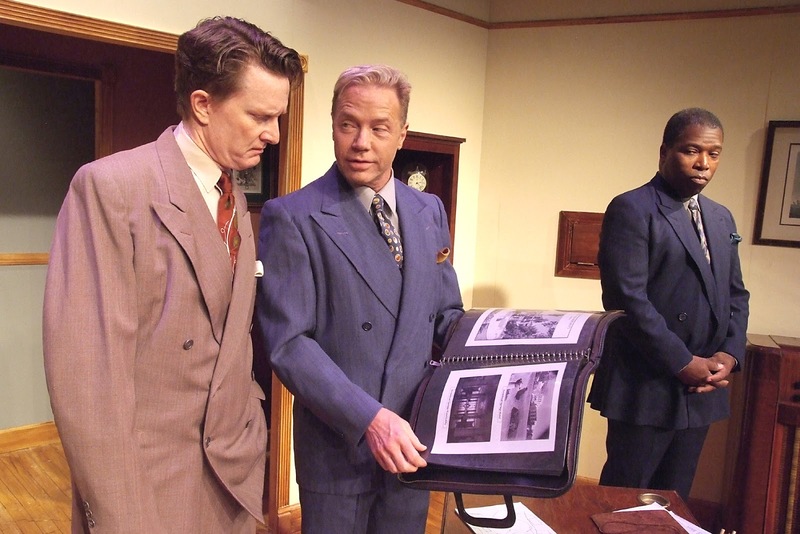 Certainly this play does that, weaving a very plausible scenario to account for the urban legend, giving every single cast member at least a few moments to shine, setting up the plot points in a good workmanlike manner, etc. But it suffers all the limits of that form as well. For example, no character really reveals much about themselves save as they would in a realistic manner to a fellow character. Thus, generally they remain opaque and in a rather pedestrian rather than compelling manner. That the set itself is very Realistic (note the capital) increases this impact. Movies, alas, beat theatre hands down when it comes to any portrayal of naturalistic realism. For that reason so much of the best theatre for a few decades now tends towards non-realistic style. Hence the success of both Shakespeare and musicals. Honestly, I felt myself longing for the characters to address the audience directly between scenes, or for an entire scene to go towards the absurd, only to be revealed as a dream. Let us be honest, though--that is merely my personal opinion. Like the rest of this review, which overall remains quite positive. After all, can I really complain about a period play that uses a period style of theatre? Well, yes, obviously I can. But--maybe I really shouldn't.